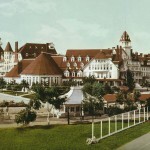 The tales of the Hotel del Coronado are remarkably consistent and their ghost has a name: Kate Morgan a young woman who checked in to the Hotel del Coronado and committed suicide with a gunshot wound to her head. There is no suspicion that it might have been a murder as she was seen to be despondent and she had purchased the gun in town herself. Although she is said to primarily haunt the room she had stayed in (formerly Room 302, though it is now numbered 3312) her presence can be felt throughout the hotel. People claim to have seen her in hallways, in the shops and she is occasionally mischievous, knocking items off the shelves, moving items in her room, etc. Her room is apparently the most often-reservered room so if you are looking to do a paranormal investigation there, you may want to plan in advance. Well I am a san diego resident, and we were poking around town one day. Got to the hotel and decided to explore it. Knew the room and when we found it, the housekeeper was inside. Its an extremely tiny little room. We asked her if it was the haunted room, and she said yes. Im told there are actually two haunted rooms in this hotel. And the stories I heard about the female ghost (the other is male) were not of a happy mischevious ghost, but a violent one. We walked into the room, laughing and looking around. Went into the bathroom, just to peek in, and the light went on while were standing there talking. My female friend ran out of the room. True story. Wish it were more dramatic lol… but it did happen. We went to San Diego for spring break and we went to the Maritime Museum and at that museum you can go on a boat ride all the way to the Coronado bridge and back so during that boat ride our tour person on the boat was telling us the history about the buildings near by and he mentioned this hotel and that it is haunted and told us what room number but I can’t remember everything he said about the hotel but a movie had been made there and a ghost knocks things down in the building. We stayed in a room that wasn’t one of the “haunted” ones in May. Was watching Tv and all of a sudden my baby’s toy flew off the counter out of nowhere. Freaked me and my wife out. We both stared at each other and decided to go to the bar to “cool off” from the situation. Got drunk and fell asleep scared. I am a resident in Oceanside and I had two separate incidences happen. The first one was probably in spring of 1996. My parents came out for a visit from Iowa and stayed at the Hotel Del. 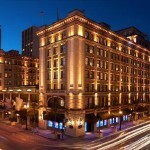 I decided to spend the first night with them because I love the hotel and it’s Charm and thought it would be fun. The bellman took us to our room on the fourth floor. He asked if we had any questions and I said I heard the hotel was haunted and asked if that was true. He said, “Yes,” and told us about their ghost, Kate Morgan and said she was from Iowa. My parents said, “We’re from Iowa!” Then he told us we had the room above Kate’s room, (which is #3327). Well, that night my mom and I were sleeping on the bed and something woke me up at about 2:30 am. My dad’s white t-shirt was hanging mid air by the shoulders above my feet. I stared at it for a minute or two, then it dropped. I waited, and then I sat up and grabbed the t-shirt! I looked to see if I could see Kate, but I couldn’t, so I went back to sleep. The next incident happened in around September of 2005. I went to a conference at the Lowes Hotel down the street. Afterward, a friend and I went to the Hotel Del so I could check the gift shops for any books on Kate Morgan. I told the ladies who worked in the shops about my incident. We walked around the hotel for awhile and then my friend said to me she noticed the hotel had a strong scent. I said, “Yes, it does! Kind of like an old, heavy ‘woodsy’ scent.” We then went to the lobby and asked at the check-in desk about Kate’s room. They said it was vacant and we could take a look. A bellman, Mike took us up on the elevator. When we walked into room #3327, Mike noticed the ceiling fan was on and said he didn’t turn it on. I noticed the bathroom door was shut. When we went to leave, I decided to take a look in the bathroom. I opened the door and the toilet flushed! I turned and said, The toilet flushed!” Then, a hand towel lifted off the towel bar and flew at our feet! We all ran out of there! My friend and I then went to the gift shops and told the ladies who worked there what had just happened. The one said, “I think Kate followed you.” My friend and I then went to the car and started driving home. 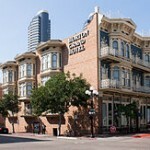 When we got to the Coronado bridge and my friend said to me, “I smell the Hotel scent in you CAR!” I said, I do too! I smell the old, heavy ‘woodsy’ scent pumping out at us through the vents!” When we got to the end of the bridge, the scent finally went away! I fortunately have had anything strange happen to me since then.